Laura Wortman and Kagey Parrish share more than many couples. As The Honey Dewdrops, they share stages from venues to festivals across North America, stretches of rolling, infinite roadway, and a lot of songs; they share one microphone and a desire to pay attention to what lasts. This hunger to explore and document is evident in their 2012 release “Silver Lining,” a top ten record on national folk and Americana stations. With tight harmonies and instruments that include clawhammer banjo, mandolin and guitars, the effect is to leave listeners with the hearts of songs, and clarity over ornamentation. 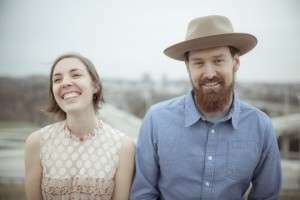 After a year and a half of living on the road, Laura and Kagey now call Baltimore home and it’s where they wrote and recorded their fourth full-length album, “Tangled Country.” Their songs are raw and engaging, with characters and images from kindred people and places. And like their stage performance, these new songs rock and reel, and then they console you when you come back down. Here’s a link to some of their tunes. I think they’re terrific, and I hope you’ll come and hear them.